It was with tears in my eyes that I arrived to Annapurna House in Swayambhu, Kathmandu last week to be greeted by the children and staff of The Umbrella Foundation after five years of absence from Nepal. 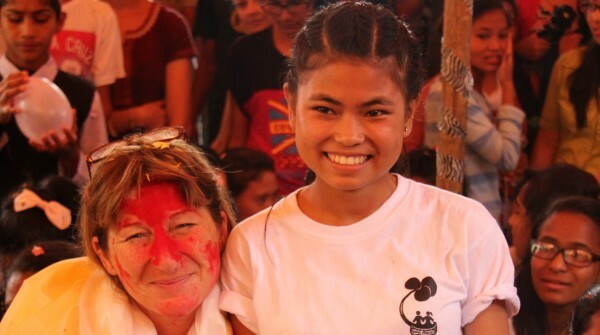 I never expected to be gone so long, but personal circumstances intervened and although I am now happily resettled in Ireland, I miss living in Nepal and especially I miss the children of the Umbrella. Who could have guessed, 10 years ago, when we began the work of the Umbrella that all these years later, Umbrella would still be thriving and still supporting so many of the children displaced during the civil conflict by both war and poverty. I arrived during a particularly heavy thunder storm (it is monsoon here after all!) but that did not dampen our spirits as the children and staff, one by one, came forward to give me tika, katas and flowers, then each of the remaining three houses performed dances and songs for me and speeches were read so confidently from each house as well as from the older children who now live independently in and around Kathmandu and who came over especially to welcome me home. Obviously, I cried like a baby throughout the proceedings, so touched and emotional to see the incredible success story that has been Umbrella. I am very much enjoying my 2 week vacation here in Nepal and am visiting the houses daily to talk, eat and play with the children, who all look so happy and healthy and who have grown up to be educated, confident and productive members of Nepalese society. Please allow me to take this opportunity to thank you all, sincerely and forever, for your support of this amazing little organization. I guess we really did light a candle in the darkness and with your support, Umbrella will continue to play a vital role in the lives of these and other children. A farewell letter from Rajendra!